Aim: Comparative evaluation of postoperative sensitivity (POS) among three bulk fill restorative materials (Cention N, Equia Forte, Activa™ Bioactive restorative) in Class I posterior restorations. Materials and Methods: One hundred and forty-four patients having occlusal caries were arbitrarily selected and divided into three groups. Standardized Class I cavity was prepared and restored with Cention N, Equia forte, and Activa™ Bioactive restorative material. POS of restored tooth was assessed with a standardized cold test and air stimulus by air blow from the air syringe. Patient responses were assessed at an interval of 24 h, 1 week, and 1 month using a visual analog scale. Statistical analysis was performed using paired t-test, independent t-test, one-way ANOVA test, and Tukey's post hoc test using SPSS 11.0 program (SPSS Inc., Chicago, IL, USA) for windows. Results: The statistical analysis showed a significant difference in the clinical evaluation of POS at 24 h interval among three groups (Cention N, Activa™ Bioactive Restorative, Equia forte). However, following 1 week and 1 month, there is no significant difference in Group C (Activa™ Bioactive Restorative). Conclusion: POS was seen more in Cention N contrast to Equia forte and Activa™ bioactive restorative material. Timely advancement in the dentistry and the quest for the development of ideal materials to replace lost dental tissue has led to widespread use of resin-based composites to restore posterior teeth. Increasing concerns about esthetics, possibility of more conservative restorations, using the minimally invasive technique, and mercury content in the amalgam restorations have been the reasons for the determination of these materials in stress-bearing areas. 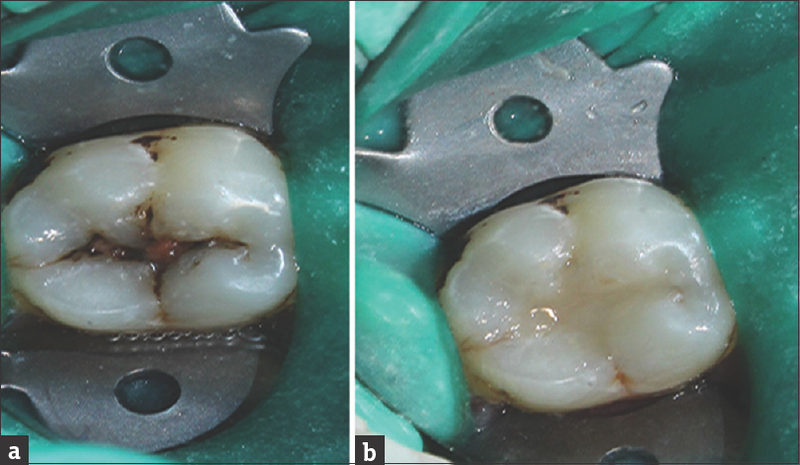 In spite of being advocated for its use in areas of minimal stress historically, the expanded request has prompted a more prominent utilization of these restorations on posterior teeth, where considerable mechanical stress is generated during the function. To withstand these stresses, timely modification with the use of filler particle with various size and morphology has resulted in improved mechanical properties. Filler particles also allow for a reduction in monomer content with improved handling properties and influences postoperative sensitivity (POS), wear resistance, translucency, opalescence, intrinsic surface roughness, and polishability. In 2006, James Summit expressed that the POS occur after composite restoration because of the polymerization shrinkage as a result of which gap is formed beneath the restoration, which is then accumulated with dentinal fluid in 24–36 h. Thus, when the affected tooth is exposed to heat or stimuli, it results in expansion and contraction of dentinal fluid in the gap formed, which cause fluid movement in the dentinal tubules leading to POS. With the advances in the material sciences comes the pioneering era of “bulk-fill” composite restoratives that are alleged to allow the build-up of composite restorations in layers up to 4–5 mm. Bulk-fill composite materials have some advantages over the conventional composites including increased depth of cure and low shrinkage stress. Equia (GC America INC) is a new glass ionomer (GI) restorative system. It is a combination of a self-adhesive, chemically cured, highly filled GIC (FUJI IX GP EXTRA, GC) and a self-adhesive, light cured, filled resin surface sealant (G-COAT PLUS, GC). This material has the property of increased fracture toughness, flexural strength, and flexural fatigue resistance which is required in Class I restorations. Cention N (Ivoclar vivodent) is tooth-colored restorative material with high flexural strength. It belongs to the materials group of Alkasites and basic filling material for direct restorations. It can be used as a full volume (bulk) replacement material. So far, there have been limited numbers of studies available in the literature investigating POS after incremental resin composites and bulkfill composites restoration placement. Therefore, the aim of this study is to clinically evaluate the POS among Equia Forte, Cention N and Activa™ Bioactive Restorative in Class I restoration using visual analog scale (VAS). The present study is a randomized controlled trial with proposed requirement of total 144 patients or sites equally divided into three groups or subsites to check mean VAS score difference between groups by 2.1 with standard deviation 4.5 at 5% risk and 80% power. Arbitrary selection of 144 patients, both males and females, aged between 18–45 years, diagnosed as having Class I dental caries in a maxillary/mandibular premolar or molar was done from the Outpatient Department of Conservative Dentistry and Endodontics, Manubhai Patel Dental College and Hospital, Vadodara. Informed consent from all the patients was taken. Charting of records–medical and dental history was done. The diagnosis was done by clinical examination and intraoral periapical radiographs. This study protocol was approved by Research and Ethical Committee at Manubhai Patel Dental College and Hospital (Approval No.-MPDC_115/CONS-20/17). All the patients were diagnosed with a class I dental caries and divided into three groups. Teeth with the presence of any pathologic pulpal disease with or without pain. Teeth with previous restorations, any defective restoration adjacent to or opposing the affected tooth. Teeth with surface loss due to attrition, erosion, abrasion, or abfraction. Patients with poor oral hygiene, severe, or chronic periodontitis. Patients having allergy to the materials used in this trial. 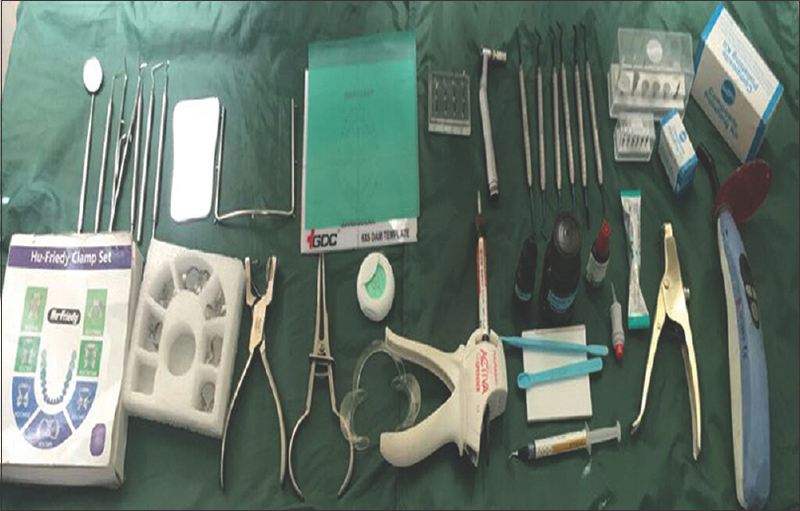 The material used for cavity preparation included Diagnostic instruments, Rubber dam kit (GDC), Highspeed air turbine handpiece (NSK INC. Japan), Round diamond bur (Mani INC. Japan) and No. 245 straight fissure diamond bur (Mani INC. Japan). Restorative material was placed using 34% tooth conditioner gel (3M ESPE, USA), lightemitting diode light curing unit, threeway airwater syringe, Cention N (IVOCLAR VIVADENT), Equia forte (GC America INC), Equia coat (GC America INC), Capsule applier III, Capsule mixture, Activa™ bioactive restorative (PULPDENT), and Teflon coated composite placement hand instruments (GDC). Finishing and polishing were accomplished with composite finishing and polishing kit (SHOFU INC. JAPAN) [Figure 1]. Isolation was done with the help of a rubber dam (GDC/HU FRIEDY) followed by Class I cavitiy preparation. Class I cavity was prepared by removing caries using a round and NO.245 straight fissure diamond bur (Mani Inc., Japan) in a high-speed air-turbine handpiece (NSK INC., Japan) with copious water irrigation. Burs were replaced after every eight preparation. Class I cavity was rinsed thoroughly with water and dried. One measuring scoop of powder and one drop of liquid (this corresponds to a weight ratio of 4.6:1) was taken. The powder was isolated into two similarly substantial parts utilizing a plastic spatula. The fluid was spread to expand the surface. The main part of powder was blended with the whole fluid administered on the blending cushion. After every one of the segments has been altogether mixed, outstanding powder was included and mixed again until (45–60 s) a homogeneous consistency was accomplished. The working time was 3 min from the beginning of mixing. The material was applied to the cavity, carefully adapted and condensed. Any occlusal excess was removed; the restoration was light-cured after placement for 40 s followed by finishing, polishing and checking of occlusion for any high points [Figure 2]a and [Figure 2]b.
Cavity was rinsed thoroughly with water and dried with cotton pellet or by gently blowing with the three-way syringe. Cavity was etched with 37% phosphoric acid (3M ESPE, Scotch bond) for 15 s and rinsed with water for 15 s, followed by drying. The capsule was placed into a metal GC Capsule applier and activated just before mixing and used immediately and set into a mixer and mixed for 10 s. The mixture was removed immediately from the capsule and extruded directly into the preparation. After that was the application of EQUIA Forte coat and light cure for 20 s followed by finishing, polishing, and checking of occlusion for any high points [Figure 3]a and [Figure 3]b. Class I cavity was etched using 37% phosphoric acid (3M ESPE, Scotch bond) for 10 s, rinsed with water for 15 s. Water was expelled from the rinsed cavity with a gentle blow of air and was blot dried, leaving a moist surface. Mixing tip was placed on the Activa™ bioactive restorative syringe, syringe inserted into ACTIVA™ bioactive restorative–SPENSER and snapped into place using firm pressure. The material was dispensed using gentle pressure. 1–2 mm of material was dispensed onto a mixing pad and discarded to check the even mix of the base and catalyst. The restoration was light-cured for 20 s followed by finishing, polishing and checking for any high occlusal points [Figure 4]a and [Figure 4]b.
POS was assessed of each restored tooth at an interval of 24 h, 1 week, and 1 month using the VAS score with a standardized cold test [Figure 5] and air stimulus by air blown from the air syringe with a standardized distance of 5 mm (45 psi). The patient responses were then assessed using a VAS scoring index. The VAS is a 10-cm line with the anchor words “no sensitivity” (0 cm) at one end and “intolerable sensitivity” (10 cm) at the other end. Every patient was requested to place a vertical mark on the VAS line to indicate the intensity of sensitivity level after the administration of the stimuli for each tooth and determined the sensitivity scores and quantified each patient's response to each restoration by measuring the distance in cm from the anchor word (0 cm) to the mark. The mean and standard deviation of the POS was calculated for each group. The data showed normal distribution, and there was homogeneity of variances between the groups. The results were evaluated with a 95% confidence interval. The significance level was set at <0.05. All statistical analyses were conducted using SPSS 11.0 program (SPSS Inc., Chicago, IL, USA) for windows. The Comparison of mean values of two groups was done using independent ‘t’-test for two sample means. Paired t-Test was carried out to compare mean value between the time period (1 day, 1 week, and 1 month) [Table 1], [Table 2], [Table 3]. In the present study, a total of 144 patients were considered. Of the total 144 patients, 119 patients treated were between ages 18–30 years. The statistical analysis showed a significant difference in the clinical evaluation of POS at 24 h among three groups (Cention N, Activa™ Bioactive Restorative, Equia forte) but after 1 week and 1 month interval, there was no significant difference in Group C (Activa™ Bioactive Restorative) [Graph 1] and [Table 1], [Table 2], [Table 3]. Contemporary resin composite restorative materials reveal good clinical performances for the restoration of posterior teeth. Nonetheless, POS is a well-known problem with the resin composite restorations. Bulk-fill resin composites are novel direct restorative materials. However, the incidence of POS with bulk fill restorative resin, and its comparison with incremental composite resin is yet to be answered before deciding the use of bulk-fill composites as a standard of care for the restoration of teeth with profound decay. POS at the interval of 24 h, 1 week, and 1 month was assessed using cold test and air blast test with VAS. It is a subjective assessment method, a VAS (values 0–10) providing effective statistical test evaluation and exact measure of pain. It was found to be higher in patients treated with Cention N (29.2%) followed by Equia forte (12.5%), and Activa™ Bioactive (4.2%) being the least at an interval of 24 h. Less POS in patients restored with Activa™ bioactive is attributed to the biologically active ionic resin matrix, reactive, and shock absorbing rubberized GI fillers in the active which chemically bonds and seals teeth against bacterial leakage. Dynamic system of ionic exchange with saliva and tooth structure, continuously releasing and recharging calcium, phosphate and fluoride ions and reacting to pH changes in the mouth. Activa™ bioactive restorative triggers the mineral apatite formation and remineralization, which is the defining requirement of bioactive materials. This process unites the restoration and the tooth together, penetrates and fills micro-gaps, reduces sensitivity, guards against secondary caries, and seals margins against micro-leakage and failure.,,,, These results were in congruence with the findings of the research study by the pulpdent corporation who noted some level of postoperative hypersensitivity in 5% of patients treated with active bioactive restorative at 1 year recall, gradually becoming insignificant. The high incidence of postoperative hypersensitivity with Cention N restorations can be attributed to low volumetric shrinkage due to organic, monomer part in the liquid of Cention N. The liquid contains different dimethacrylates which represent 21.6% wt. of the final mixed material. A combination of Urethane dimethacrylate (UDMA), Tricyclodecan-dimethanol dimethacrylate, an aromatic-aliphatic-UDMA and Polyethylene glycol 400 dimethacrylate (PEG-400 DMA) cross-links during polymerization resulting in strong mechanical properties and good long-term stability but also a low volumetric shrinkage. The organic/inorganic ratio also affects the volumetric shrinkage leading to postoperative hypersensitivity. Equia Forte is glass composite metamorphoric material, achieved through the addition of ultrafine, highly reactive glass particles disseminate within the conventional GI and higher molecular weight polyacrylic acid. The resultant new glass blend formulation builds a high strength restorative material. Adhesion of EQUIA which uses Fuji IX GP Extra, a highly filled GIC, to dentin occurs by a micromechanical interlocking and a chemical bonding with the hydroxyapatite in enamel and dentin. 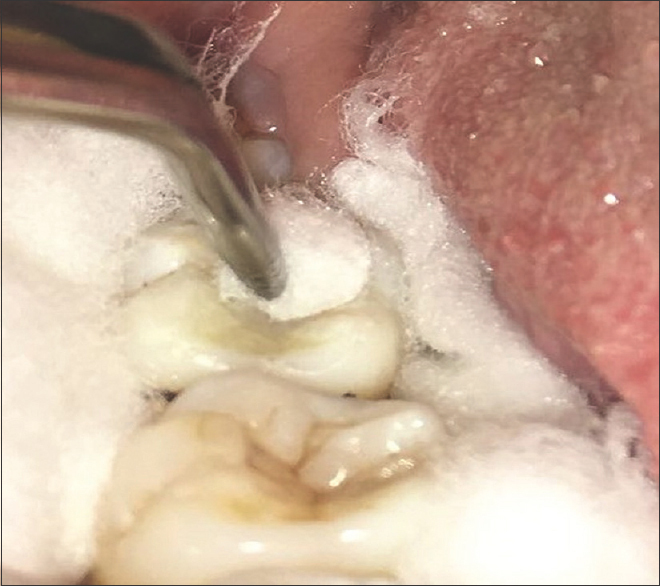 These metaphoric alteration results in a robust, bulk-fill GI restorative system with excellent physical properties, esthetics and possibly less hypersensitivity. The results of the air blast test and cold test used to evaluate postoperative hypersensitivity were identical with the findings obtained with the VAS. The uniqueness of this study lies in the fact that it is the first of its kind in vivo study performed to evaluate postoperative hypersensitivity between these materials with uniform age group patients distributed in all the study groups. It is performed by single operator with multiple tests adopted (Cold test, Air blast test, VAS) to rule out any possibility of subjective bias. Shortcomings of this study include inadequate sample size and limited duration of follow-ups to prove the long-term success of these materials. Further in vivo studies with these materials in all types of cavity preparations with a larger sample size and long-term follow-ups deems necessary to use them as materials of choice for restorative procedures. Other factors including anatomic form, color match, marginal adaptation, marginal discoloration, surface texture, and secondary caries need to be evaluated to assess long-term versatility of these materials. 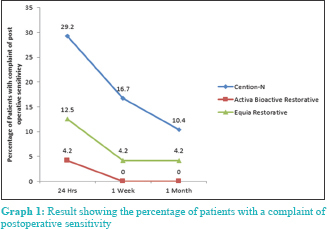 Post operative sensitivity is absent with Activa™ bioactive restorative material at the interval of 1 week and 1 month, while it is still present in patients treated with Equia forte and Cention N (highest). Gianordoli-Neto R, Padovani GC, Mondelli J, de Lima Navarro MF, Mendonça JS, Santiago SL, et al. Two-year clinical evaluation of resin composite in posterior teeth: A randomized controlled study. J Conserv Dent 2016;19:306-10. Ibarra ET, Lien W, Casey J, Dixon SA, Vandewalle KS. Physical properties of a new sonically placed composite resin restorative material. Gen Dent 2015;63:51-6. Dhanapal D, Sureshbabu NM. Comparison of postoperative sensitivity using two flowable composites in noncarious cervical lesions: A randomized controlled blinded trial. J Oper Dent Endod 2017;2:55-60. Ayer MK. Postoperative sensitivity after placement of bulk-fill posterior restoration. J Res Med Dent Sci 2017;5:53-8. Vaid DS, Shah NC, Bilgi PS. One year comparative clinical evaluation of EQUIA with resin-modified glass ionomer and a Nanohybrid composite in noncarious cervical lesions. J Conserv Dent 2015;18:449-52. Samanta S, Das UK, Mitra A. Comparison of microleakage in class V cavity restored with flowable composite resin, glass ionomer cement and centionn. Imp J Interdiscip Res 2017;3:180-83. Zmener O, Pameijer CH, Porta RD, Hernandez S, Serrano SA. Marginal Bacterial Leakage in Class I Cavities Filled with a new Resin-Modified Glass Ionomer Restorative Material; 2013. Garcia-Godoy F, Morrow BR, Pameijer CH. Flexural strength and fatigue of new Activa RMGIs. J Dent Res 2014;93:254. Slowikowski L, John S, Finkleman M, Perry R, Harsono M, Kugel G. Fluoride ion release and recharge over time in three restoratives. J Dent Res 2014;93:268. Alrahlah A. Diametral tensile strength, flexural strength, and surface microhardness of bioactive bulk fill restorative. J Contemp Dent Pract 2018;19:13-9. Rusin RP, Fitch JA, Aeschliman DB, Cummings KM. Ion release from a new protective coating. AADR Annual Meeting; 2011. Kersten P, White PJ, Tennant A. Is the pain visual analogue scale linear and responsive to change? An exploration using Rasch analysis. PLoS One 2014;9:e99485. Activa™ Bioactive Restorative. The Dental Advisor; 2017. Available from: https://www.dentaladvisor.com/evaluations/activa-bioactive- restorative-1-yr/. [Last accessed on 2018 Sep 24].